NEW YORK (AP) — A border collie named Kelso rocketed to a win in the Westminster Kennel Club’s new agility competition Saturday night, while a husky mix called Roo! ran away with the recognition afforded to mixed-breed dogs at the nation’s premier show for the first time since the 1800s. Shooting through tunnels, scrambling over ramps, weaving through poles as a tail-wagging blur and taking a tight turn with a celebratory bark, 7-year-old Kelso bested about 225 other dogs — including another shown by his college-student owner — to take the overall championship. And Roo! made it to the final five to garner a prize for the top mixed-breed, or “all-American” dog. The competition put a fast-growing canine activity on U.S. dogdom’s biggest stage, with the finals nationally televised on Fox Sports 1. While Kelso has won other agility titles, the Westminster trial was something special to his owner, Delaney Ratner. “It’s an awesome way to get our sport out there,” said Ratner, a sophomore economics major at the University of Massachusetts at Amherst. The daughter of agility trainer Cindy Ratner, she could hardly decide which dog to root for in the final five — Jonesy, a miniature schnauzer she co-owners with her mom, won his height class. A papillon named EZ, shown by John York of Royal Palm Beach, Fla., and a Pyrenean shepherd called Dash, owned by Ashley Deacon of Menlo Park, Calif., rounded out the finalists. They were scored on both accuracy and speed, with the top dog chosen through a yard-per-second calculation to account for the competitors’ different sizes. Mixed breeds had their champion in Roo!, a dog so high-spirited that she’d been adopted and returned to an animal shelter several times before San Francisco-based dog trainer Stacey Campbell took her home about seven years ago. Barking avidly as she waited to be the last dog to run, the lanky husky mix zipped through the course to cheers from the crowd at Pier 94 in Manhattan. Established decades ago, agility is an increasingly popular canine pursuit. 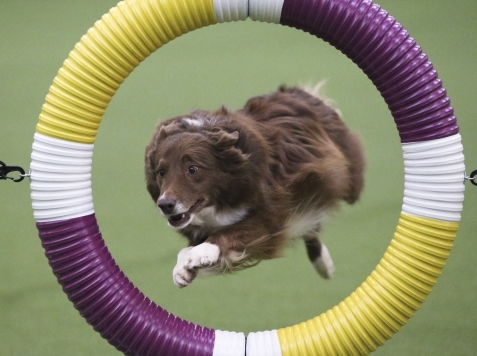 The number of dogs competing in agility trials sanctioned by the American Kennel Club, the governing body for many events, has grown by nearly 50 percent over the last five years. Agility aficionados say the sport is a canine confidence-builder that creates rapport between dogs and owners, provides a healthy outlet for high-energy pets and shows what dogs of all shapes and sizes can do. Five-and-a-half-pound, top-knotted Tommy the toy poodle, for instance, flew over the jumps and tiptoed through the weave poles to finish third in his height group. “He’s a big dog in a little dog’s body,” said owner Barbara Hoopes, a biology professor at Colgate University in Hamilton, N.Y.
Saturday’s competitors spanned 63 different breeds, and about 16 competitors were mixes, a substantial shift for a dog show that has long been purely purebred turf. The 138-year-old Westminster show featured some mixes early on, but not since at least 1884, organizers say. Mixed-breeds still can’t compete for the sought-after Best in Show trophy. But their inclusion in the agility contest has brought cheers from owners eager to show that everyday dogs can go nose-to-nose with their purebred peers. Animals-rights advocates who have criticized Westminster, and dog breeding in general, call the development a good step, though they still plan to protest the traditional part of the show next week. Westminster officials say adding mixed-breed contestants helps the show make good on its aim to honor all dogs and their roles in people’s lives. Nicole Bozich of Southern Pines, N.C., recalls being petrified by dogs before her husband persuaded her to get Audie, a probably-pug-terrier mix that a pet store was selling for $20. Obedience classes evolved into agility training and, eventually, into a spot in Saturday’s contest. Reach Jennifer Peltz on Twitter at http://www.twitter.com/jennpeltz.